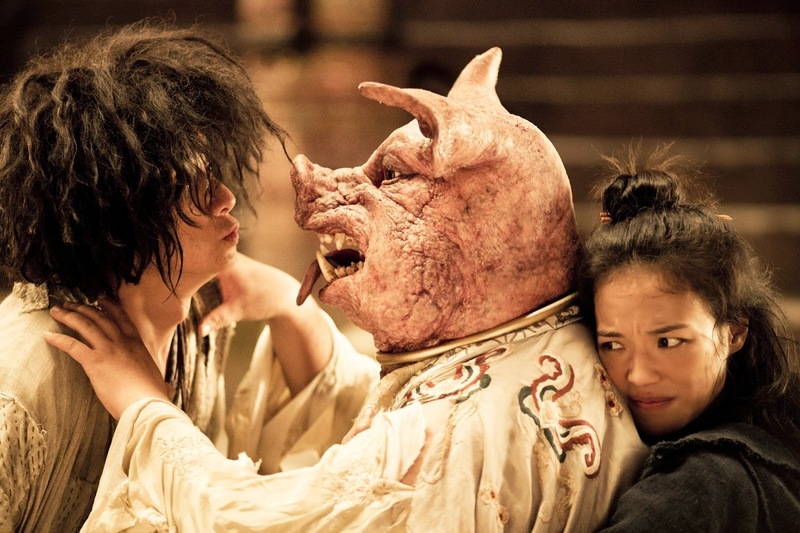 Journey to the West: Conquering the Demons is an action comedy produced, written and directed by Stephen Chow (Kung Fu Hustle, King of Comedy and Shaolin Soccer). It stars Shu Qi (Gorgeous, A Beautiful LIfe and the Transporter) as Miss Duan and Wen Zhang (The Sorcerer and the White Snake) as Tang Sanzang. Like most Stephen Chow films this blends martial arts with slapstick comedy to great effect but has a slightly more serious tone. The phrase high stakes slap stick kept leaping out at me as I watched it. Released in 2013, Journey to the West is based on the 16th century Chinese novel of the same name, but set before the monk Tang Sanzang gains his disciples and goes west in search of sacred Buddhist sutras. Tang Sanzang is the same character as Longevity Monk in A Chinese Odyssey which I talked about in another blog entry (Here: http://thebedrockblog.blogspot.com/2014/04/wuxia-inspiration-chinese-odyssey.html). Same character, he just goes by different titles that are not always translated the same into English. But this is him when he is young and still a disciple himself. He is a demon hunter whose master has taught him to defeat foes with love and compassion, using the “boundless power” of the 300 Nursery Rhymes to subdue them. is killed by a freaky looking water demon, that looks a cross between a giant catfish and lion fish. Tang Sanzang arrives, it should be pointed out with a head of messy dreadlocked hair, just as a Taoist priest claims to have vanquished the demon after killing a mere stingray. Sanzang tries to warn the villagers that there is still a demon in the water but the priest convinces them it is safe and they go back in, leading quickly to the demise of several villagers. For the next twenty or so minutes we witness Sanzang wrestling with both the priest and the demon fish in a really well choreographed action sequence that has all the comedic elements you expect in a Stephen Chow movie. However this is much darker, and we even see the water demon devour and kill a small child (and not just any child but one they spent the early minutes of the film introducing to the audience). I was a bit surprised by that and it kind of establishes the tone for the rest of the film (balancing humor and serious stuff). Eventually Sanzang beaches the fish and it transforms back into human form (in this movie all demons were humans who turned demonic after death because of some major grievance in the way they were killed or in their life). The monk takes out his 300 Nursery Rhymes manual and tries to free the demon by singing its contents. This ends with the demon beating Sanzang senseless as another demon hunter arrives (Miss Duan). Miss Duan kicks the living crap out of the demon and turns him into a sort of plush toy, to the humiliation of Sanzang. Despondent at his failure, Sanzang goes back to his master (who looks suspiciously like the Laughing Buddha: http://en.wikipedia.org/wiki/Budai) who has been busy making illustrations of the demon fish and its history. Sanzang asks if his master was incorrect to choose him for a disciple. His master says he was correct to choose him, but he just lacks that “certain something”. Next Sanzang battles a pig demon at the Gao Inn (which serves human flesh to guests, kills them and then cooks them for the next round of customers). Again Miss Duan arrives and basically picks up the slack for the monk. During the fight, Miss Duan uses a magic ring that can change size, multiply and cut demons down. She almost succeeds in capturing it and making it plush but the demon escapes and sends both hunters fleeing for their lives. In a quiet moment by the water Sanzang explains his ideals, that he hunts for the greater good in his quest for enlightenment not for money or fame. Miss Duan closes her eyes and insists on being kiss, to which Sanzang flees in terror (because he draws a distinction between greater Love and Lesser Love, seeing the latter as an obstacle in his quest). From this point on in the movie Miss Duan lovestruck, persuing Sanzang in a very aggressive, borderline criminal manner, which provides most of the humor in the middle of the film. Returning to his master, Sanzang is told that to he can defeat the pig demon by going west in search of Sun Wukong (the Monkey King) who has been imprisoned in a mountain by the Buddha. He warns Sanzang that Monkey King is tricky and will try to deceive him, but says he may gain that “certain something” if he tries to get his help. As he is leaving on his quest, Sanzang is captured by a group of foreign demon hunters who claim to kill both demons and demon hunters. The point is proven when they parade a group of prisoners that includes Miss Duan. In an effort to save Sanzang, Miss Duan claims that he isn’t a demon hunter, but her husband and a music teacher, pointing to his 300 Nursery Rhymes as evidence. They demand couple prove their love in a public display and it is quickly revealed that this was an elaborate hoax by Miss Duan to entrap Sanzang as her husband. The group of hunters are actually her subordinates and she has him imprisoned when he refuses. A lot happens here and it is a very funny sequence but the scene culminates with the return of the pig demon. Again there is another big battle and the demon proves too much for them. Three more demon hunters arrive, drawn by the lure of fame, and send the Pig Demon running away. The trio are all pompous and full of themselves, but perhaps the most endearing in the group is Prince Important. Pretending to be wounded and on the verge of death, Miss Duan tries to trick Sanzang into expressing his affection for her and he humiliates her before the trio of demon hunters and her crew. In a rage she rips up his books of nursery rhymes and he leaves to find the Monkey King. In the west Sanzang finds the monkey king in human form, and convinces him to help them capture the pig demon. Monkey King (who has been trapped in the cave for 500 years) tells him to get a beautiful women and have her dance by the moonlight to lure the creature to his cave. Having followed him to the cave, Miss Duan volunteers and they manage to trap the Pig Demon. After their victory Miss Duan places her ring on Sanzngs finger asking him to marry her, he refuses and she leaves. But before leaving she gives him back his book of rhymes which she tries to restore (however because she couldn’t read it the words are all mixed up). Monkey King basically says he is a fool to reject such a beautiful women and it becomes clear that Sanzang is having a change of heart on the issue. However Monkey King tricks Sanzang into moving a lotus flower that blocks the moonlight from entering his prison, so he can see the moon. 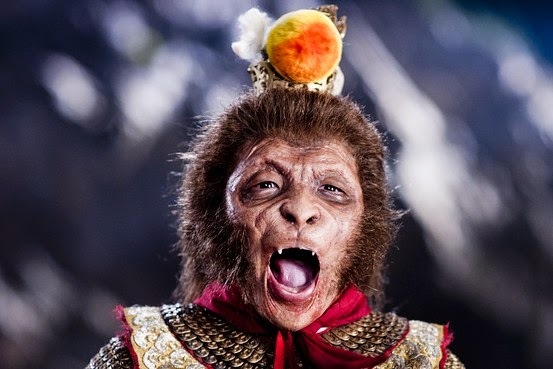 This not only frees Monkey King, but causes him to transform back into his monkey body. This is the most devilish version of the Monkey King I have seen. He is small, very small, and filled with bitter rage and cruelty. Sanzang takes a meditative position and begins to chant, causing Monkey King to demand he stop, pulling out the monks hair as he does so, until Sanzang is almost completely bald. The trio of demon hunters arrive and each face Monkey King in turn, only to be brutally destroyed. Monkey King returns his attention to Sanzang, but is thwarted when Miss Daun returns and vows to kill Monkey King for pulling out his hair. She is defeated and as she dies, Sanzang admits his love for her. Monkey King then throws her body into the sky and bursts it into a million fragments, leaving only the book of rhymes, now revealed to be a Buddhist sutra. As Monkey King taunts Sanzang, the monk (now radiant and transformed) chants from the sutra and a vast battle between Buddha and Monkey King commences. In the end Monkey King is defeated by the palm of Buddha. He then appears in a peaceful looking hill with Sanzang who places Miss Duans magic ring on Monkey King’s head, which becomes his famous circlet. 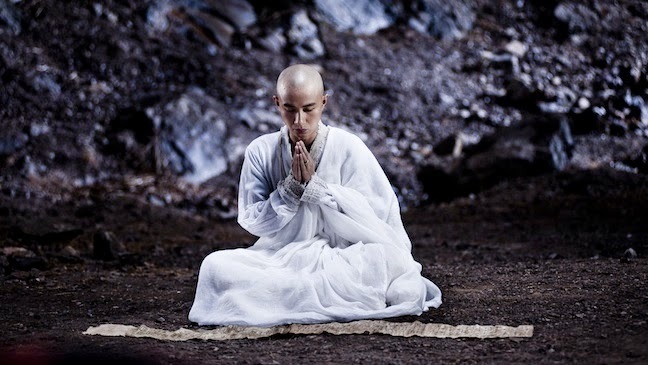 Going back to his master, Sanzang reveals that he learned through his loss of Miss Duan that there is no difference between Greater and Lesser Love. His master instructs him to go to India to bring back sacred Buddhist texts. Monkey King is now at his side as a disciple and joined by both the water demon and pig demon (the former in human form, the latter with pig-like features). They set out and we see the four companions beginning their famous quest. I was really excited about Journey to the West when I heard about it and have been anticipating viewing it all year. Normally that leads to disappointment for me, but this is a really strong Stephen Chow movie, better than Shaolin Soccer and possibly equal to Kung Fu Hustle. I liked the actors and every scene managed to both make me laugh and captivate me. You also really cared for the characters. While the very first special effect zoom looked a bit shaky, the rest of the effects were wonderful, particularly the demons and the final Buddha Palm shot at the end of the film. I was mainly focused her on giving an overview of the plot, so I may have done a disservice to the comedy of the movie (which is excellent).